Nonprofits today seem to be competing for everything: public and private funding, “mindshare” and, crucially, talent. Identifying and attracting great talent — people with the skills, experience and passion to make your mission the success it deserves to be — may be the most competitive area of all. There are great people out there who’d be a great fit for your organization, but they’re not always easy to find. And there are a lot of other organizations — and not just nonprofits, either — that would be more than pleased to have them. That’s why it’s so important that you avoid a set of hiring mistakes that I’ve seen far too many times in my years in the field. Mistake #1: Taking things too fast. Hiring takes time, at least if you want to get it right. The truth is, nobody consistently hires great talent fast. It simply can’t be done. If you’re pushing your talent acquisition people too hard for speed you risk missing out on the right people — or, even worse, hiring the wrong people. Great organizations are diligent when it comes to finding remarkable people, and they’re always plugged into the hiring process. Mistake #2: Focusing on technology, not people. In our Google-and-iPhone-and-Twitter age, it’s easy to lose touch with the basic principle that people, not technology, are what sets your organization apart. You’re hiring because you need people, and people should be the most important component of your recruiting process. LinkedIn profiles, GuideStar listings and social media postings will definitely help you identify broadly capable candidates and learn about their backgrounds and qualifications. But personal recommendations, human interactions and, most significantly, informed judgments are — or at least should be — far more meaningful criteria in your talent acquisition decisions. 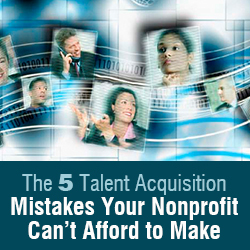 Mistake #3: Limiting your search to a too-narrow talent pool. If you’re only looking in the nonprofit sector for potential talent, you’re probably missing out on some highly qualified candidates. Many successful private-sector professionals, for example, are at a point in their careers where they want to do something more meaningful than just making money, and they can bring valuable skills and experience to your organization. Understanding who can effectively make the transition to nonprofit work — and who can’t — is critical. Of course, comparable or complementary core competencies are important. A business executive who’s raised money for start-ups might be a good fit for a development position. Typically, people coming from the private sector are best-suited — at least at first — to “on the ground” nonprofits, the ones that execute or “prove” policy. These professionals tend to excel at operations, finance, technology and development, and they often make great board members, executive directors or presidents. People coming from government agencies or from the academic world, on the other hand, are far more likely to successfully transition into policy roles, where they’ll be responsible for determining how resources can best be allocated to advance the nonprofit’s mission. And no matter where the candidate is coming from, it’s essential that he or she be passionate about that mission. These are ambitious, hard-driving people, and once they’ve achieved success in the nonprofit sector, they may be more comfortable moving on to another organization — and leaving yours behind. So make sure you’re recruiting people who care as much about what you’re doing as you do. Mistake #4: Limiting your search to too narrow a set of search methods. It’s easy to think that simply posting a position on your organization’s website, or on Monster.com, will bring you a great crop of candidates. But it’s important to remember that not everybody is actually looking for a job — and that’s especially true of the great talent you’re trying to attract. You need to be both creative and proactive in your search, and that means using all the tools available to you, including professional associations, personal connections both inside and outside the nonprofit world, and, of course, word of mouth. And don’t overlook the reality that your internal hiring managers may need some outside help from recruiters with specialized expertise. Many nonprofits today, faced with highly constrained resources, are under pressure to build capacity by themselves. But many of them are finding that without experienced people to help guide them through the art of hiring, they end up making the wrong decisions, sometimes with disastrous consequences. Hiring an outside recruiters carries costs, of course — but making the wrong hiring decision can cost a lot more. Mistake #5: Burning your bridges. Whatever position you’re recruiting for, it almost certainly isn’t the last one you’ll be trying to fill. That’s why you need to treat everyone you deal with in the talent acquisition process with the courtesy and respect they deserve. That includes the candidates you decide not to hire — many of whom might turn out to be great for future positions — and the recruiters, references and other outside contacts you’ve looked to for guidance in the recruiting process. Take the time to reach out to them, thanking them for their participation and inviting them to keep in touch with you in the future. Your organization’s reputation will benefit from it — and so will your future talent acquisition efforts. 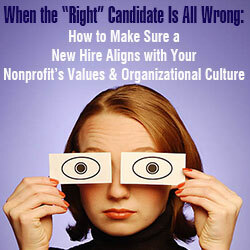 Now that you know the most important mistakes to avoid in talent acquisition, I’d like to offer one very positive recommendation: Bring to the recruiting process the same creativity and passion that got you into the nonprofit sector in the first place. Today’s information-saturated age makes it easy to find lots of potentially suitable candidates, but, paradoxically, it makes it even more difficult to sort through them all to find exactly the right candidate. That’s why it’s critical to be creative — “thinking outside the box,” to use an overused but still relevant expression — so that you can find someone with the right skills, the right experience and the right commitment to your organization’s valuable mission. 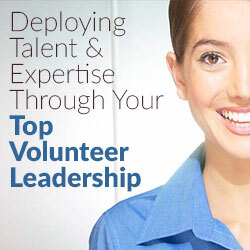 We all know the potential results of unsuccessful talent practices in nonprofit organizations: difficulty filling positions, increased staff turnover and burnout, low staff morale, and an overarching downgrade of human capital as top performers leave for organizations with stronger talent practices. There is a plethora of research outlining the financial implications of these challenges. 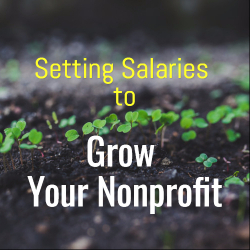 For example, the price of one employee leaving their position is estimated to cost a nonprofit organization at least 150 percent of that employee’s annual salary. The implications do not stop there. Who achieves an organization’s goals? People. Who implements an organization’s marketing strategy? People. Who raises money to support an organization’s programs and growth? People. 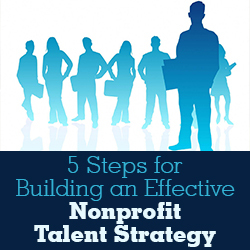 For these reasons alone, every nonprofit should strive to have the same level of rigor around their talent strategy as they do around marketing and fundraising strategies. Especially when the success of achieving a nonprofit organization’s mission is so obviously dependent on the people employed there. Understand what your organization is trying to achieve. This means setting concrete and measurable organization-wide goals that a talent strategy can then reflect and support. For example, if your organization is planning on launching a new service or program, the talent team will need to ensure they have talent pools that are ready to fill new openings. Assess your current bench. Do the people in your organization have the skills and experience required to achieve these goals? Or are you venturing into a new area that requires bringing new expertise? Maybe your organization is growing in size and complexity, and now requires a more sophisticated management skill set. The talent team needs to be aware of any changes on the horizon in order to plan for a professional development program that will prepare staff for the future and fill current gaps with new talent. Start leveraging data. Data driven decision-making is the anchor for any effective talent strategy. Without it, your organization will be shooting blind at an unknown target. For example, individual staff performance data should inform every single decision your organization makes about talent: who gets promoted, where you invest professional development resources, how you embed strategic succession planning to prepare for future organizational evolution. Market data should inform how much individuals are compensated and how. Engagement data should inform priorities for improvement. Put it all together to inform your talent strategy. Once you know what your organization aspires to achieve, what skill gaps exist in your talent pool, how engaged your staff is, and have concrete data to refer to, your strategy will become clear. Top talent priorities and areas of urgency will rise to the surface. Now, your job will be to translate these into concrete goals, initiatives, and actions that the organization can take to advance talent practices. As a recent post-grad who has long been passionate about working in the nonprofit sector, specifically in regards to social justice, environmental awareness, and grassroots causes, I was surprised to hear how many of my peers were either interested in going right into nonprofit or transitioning from for-profit to NGO after a few years out of college. From my experience as a twenty-something, I have seen a significant shift in what has been expected and encouraged of young professionals and post-grads. This shift is not to say that the for-profit sector (banking, real estate, business, finance, etc.) will be negatively impacted by this adjustment in employment and change in professional endeavors and mindsets, but I think this gradual move and interest in a different sector should definitely be noted, especially when interviewing young professionals for nonprofit sector positions. One of the central differences between the for-profit and nonprofit sector is in the driving force and overall objective of the body of employees. In the simplest of terms, typically for-profits’ primary goal is to make commission while nonprofits are concerned with assisting their community in some way and when they do deal with money, it’s often in regards to keeping the organization operating. So, why have young people’s interests peaked around the nonprofit sector? The economic incentive and concisely and routinely operational approach has been extremely appealing to recent post-grads for quite some time, but after asking a few young professionals why they have transitioned to the nonprofit sector and what makes them stay, we start to gain a better sense of what the nonprofit world provides, its positive attributes, and what makes it a fruitful and morally rewarding field to work in, especially for young professionals. Heidi (25) is a current employee at a nonprofit in Boston that helps provide top health care to everyone in the Boston community regardless of income. “I held jobs at two for-profit companies after graduation and after the initial thrill of starting each position, the high eventually wore off and I looked around and asked myself why I even cared about what I was slaving away for.” Heidi comments on her transition from for-profit to nonprofit, “The answer was that I didn’t care, not at all. Personally, I need to have a connection and passion for the person/company/organization I’m devoting most of my waking hours to.” Heidi, like many young nonprofit professionals, are driven by the cause and service that the organization provides to its community. Human, animal, and environmental-centered nonprofit organizations are unyielding in their meaningful and honest examination of community, which is why they have not only caught the eye of many young professionals, but also the heart. “Seeing how my work can impact my organization in even the tiniest of ways is the most rewarding part of my job. When you help people see the difference your organization makes in ways both big and small, it’s ridiculously rewarding. Everyone in our office shares a common goal that isn’t just making money for our CEO. We’re fighting to show everyone out there how we’re changing health care for the better and how our research is saving lives.” After working her two for-profit jobs and landing her first nonprofit job, Heidi has decided to make nonprofit work her career and continue to facilitate change in her community. But Heidi’s story mirrors many new and young nonprofit professionals who have recently discovered the meaningful contribution they can make to their local and global community through the nonprofit sector. Like she mentioned, while working at her nonprofit Sarah was able to develop new skills and discover new interests in different departments of the organization, which is a significant motivator for young people to work in the nonprofit sector. For millennials who can’t wait to get their hands on any new endeavor, professional opportunity, and innovative technology, young people are eager to diversify their skillsets and professional experience. With recent post-grads having several internships under their belt, young people are well-equipped to dive into new departments, cross over between a few, take on several different professional opportunities at the same organization, and take risks to try something new. The opportunity to gain new skills and become a professional ‘jack-of-all-trades’ by your mid to late 20s, is an advantageous aspect of working in the nonprofit sector, an environment where the more you can do and contribute, the better. From my personal and professional experience, as well as Heidi and Sarah’s, the earnest dedication and drive young people have to contribute their skills, knowledge, and tech-savvy suggestions brings a distinct energy to an organization and fuels the fight for equality, fairness, and justice. Working in the nonprofit sector to better communities, improve the quality of life for people, and work towards a more just and verdant society is starting to not only be at the forefront of young people’s minds, but at the forefront of their professional pursuits as well. According to a 2011 study by ad agency network TBWA/Worldwide and TakePart, 7 in 10 young adults consider themselves social activists. This percentage is becoming clearer through the professional passions of young people to normally take a lower pay than a for-profit job, work or volunteer in several different professional areas and departments, and commit themselves to an organization not only professionally but emotionally as well. Have no doubt that this younger shift in employment in the nonprofit sector will instill a reenergized and spirited effort to spark community change. The introduction of younger professionals in the nonprofit sector will bring about a more diverse age range in the field and certainly give rise to a united front of activists and philanthropists, of all ages, standing side by side, to fight for a common cause. It’s an increasingly common trend: After making their mark in the corporate world, senior-level executives want to give back by taking on a leadership role within a nonprofit. The good news is that 73 percent of nonprofits surveyed said they value for-profit experience in candidates, and 53 percent have significant for-profit management experience represented on their senior leadership teams. 1) Understand that there may be many more stakeholders involved in a nonprofit – and the opinions of each matter. The biggest adjustment for corporate professionals entering the nonprofit world is often the number of stakeholders involved in a nonprofit – each of whom has input to share. While corporate professionals’ primary focus is almost entirely on three groups (shareholders, customers and employees), nonprofit leaders must consider a significantly larger audience that could include funders, employees, elected officials, patients or clients, families of patients and clients, alumni, etc. Successfully navigating the various relationships of the nonprofit world requires a careful understanding and concern for all parties involved. 2) Be prepared for a different culture at a nonprofit. The culture of a non-profit generally has a far more collaborative leadership style than for-profit organizations. Unlike the corporate world where decision-making typically rests with one individual or a small group of executives or directors, the nonprofit world encourages broad input in order to arrive at a group consensus. Those entering the nonprofit workplace will probably have to involve two to three times as many colleagues in the decision-making process than they did at their former company. Another unexpected but consistent cultural difference in nonprofits relates to how they interface with other members of the nonprofit community, including “competitors.” For-profit companies often have varied and complex relationships with suppliers, competitors and other entities in their sector. For-profit executives often expect nonprofits to be highly collaborative with each other. The reality is that they are often fiercely independent and competitive – sometimes to their detriment. So ideas related to cross-agency cooperation, outsourcing and other structures are usually a very tough sell. 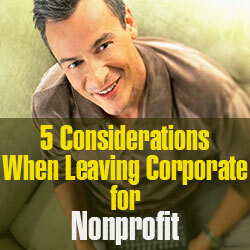 3) Acknowledge the sometimes-strong stereotypes that nonprofit employees may have about the corporate world. You can cut your way to profitability. Corporate people are used to having unlimited financial resources at their disposal. Corporate people have not had serious personal challenges, suffering or bad luck in their lives. Rather than dismiss perceptions, a leader who is new to the nonprofit world should acknowledge and address preconceived notions about corporate professionals. 4) Self-disclosure and transparency can go a long way in confronting stereotypes and misconceptions about the corporate world. New nonprofit leaders will want to go out of their way to rise above stereotypes or misperceptions about their corporate past. They will strive to be understood as individuals, rather than stereotypes. Self-disclosure and honesty are imperative to building relationships with new coworkers and breaking down misconceptions about life in the corporate world. 5) Decide when it’s appropriate to take risks, and when it’s necessary to play it safe and slow down a bit. Corporate leaders move quickly, whereas nonprofit executives are accustomed to avoiding risk and moving at a slower pace. New nonprofit leaders transitioning from the corporate world may have to slow their pace and get permission before moving forward with a plan. While the transition comes with its unique difficulties, making the move from a corporate role to one at a nonprofit is doable, rewarding and can offer a much-needed change of pace for executives.